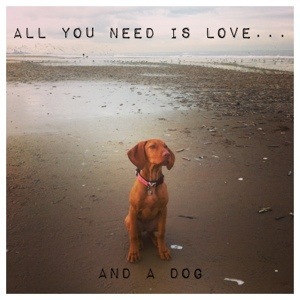 All you need is love…and a dog – . Finally some time for blogging again and this time it’s not about MS, but my very “best” medicine. If we are connected on Facebook, I guess you’ve already got an idea how important she is to me. ( and feeling very low) and didn’t leave the house for days. Now I don’t have a choice – I need to go outside for hours each day, get fresh air and exercise. I worried about the future the entire time – now I don’t even have a minute left for too much thinking. I met so many new people thanks to her and became friends with other dog owner. It’s like living in a new city as she makes me see areas I’ve never been to before. Days with her are never boring, so much to discover and learn. She made me run again. Ruby feels my bad days and never leaves my side. That’s the great thing about dogs – they don’t care who you are. Old, young, healthy, ill, if you love them they give you twice as much in return. Luckily Ruby is a typical vizsla, very high energy outside, she can and needs to run for hours – but once inside, all she wants is to cuddle on the couch. She’s my physiotherapist and made me walk long distances again, my psychologist at other times as she makes me feel better, entertainer, heating pad and best buddy. I can’t imagine a day without her anymore and am looking forward to hopefully many many years with her by my side. I really wanted you to have a dog – our Hannah lifts our spirits more than I can say. We love you both!